If your WordPress installation updates just stops after showing the message “Unpacking the update”, try increasing the memory limit of PHP. Unzipping the update takes quite a bit of memory. Newer versions of WordPress keep getting larger and larger, requiring more memory to unpack. So it can suddenly break, as it did for me. Name it something like “phpinfo_52349602384.php”. The random name is so that if you forget to remove the file, automated vulnerability scanners won’t find it. Open that file in the browser and the memory limit should be mentioned somewhere under “memory_limit”. 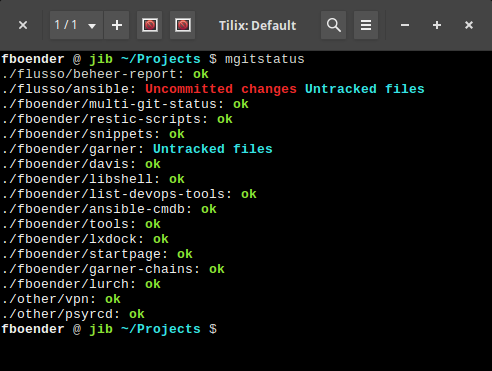 My multi-git-status project can now do a “git fetch” for each repo, before showing the status. 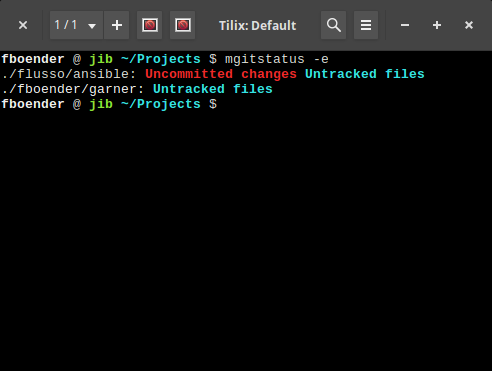 This fetches the latest changes in the remote repository (without changing anything in your local checked out branch), so that mgitstatus will also show any “git pull”s you’d have to do. Update: Kyle Spearrin, the lead developer of Bitwarden, contacted me regarding this blog post. Some issues (unnecessary loading of resources from CDNs and disclosure of my email address to a third-party without confirmation) have already been resolved. Mitigations for other issues were already in place, although I haven’t had time to confirm this yet. I’ll update this post with more details as soon possible. I only looked at the cloud hosted version. This security review is not exhaustive, I only took about a few minutes to review various things. I’m not a security researcher, just a paranoid enthusiast. If you find anything wrong with this blog post, please contact me at ferry DOT boender (AT) gmaildotcom. There appears to be no distinction between the authentication password and encryption password. Okay, at least that’s not my plain text password. It is encoded, hashed or encrypted somehow, but I’m not sure how. Still, it makes me nervous that my password is being sent over the wire. The master password used for encryption should never leave a device, in any form. I would have expected two password here perhaps. One for authentication and one for encryption. The reason it was implemented this way is probably because of the “Organizations” feature, which lets you share passwords with other people. Sharing secrets among people is probably hard to do in a secure way. I’m no cryptography expert, but there are probably ways to do this more securely using asymmetric encryption (public and private keys), which Bitwarden doesn’t appear to be using. Bitwarden salts and hashes your master password with your email address on the client (your computer/device) before it is transmitted to our servers. Once the server receives the hashed password from your computer/device it is then salted again with a cryptographically secure random value, hashed again and stored in our database. This process is repeated and hashes are compared every time you log in. The hashing functions that are used are one way hashes. This means that they cannot be reverse engineered by anyone at Bitwarden to reveal your true master password. In the hypothetical event that the Bitwarden servers were hacked and your data was leaked, the data would have no value to the hacker. Roughly translated, it allows indiscriminate loading and executing of scripts, css, web workers (background threads) and inclusion of framed content from a wide variety of untrusted sources such as CDNs, Paypal, Duosecurity, Braintreegateway, Google, etc. Some of these I know, some I don’t. Trust I have in none of them. It would take too long to explain why this is a bad idea, but the gist of it is that the more resources you load and allow from different sources, the bigger the attack surface becomes. Perhaps these are perfectly secure (right now…), but an import part of security is the developers’ security mindset. Some of these resources could have easily been hosted on the same origin servers. Some of these resources should only be allowed to run from payment pages. It shows sloppy configuration of the Content-Security-Policy, namely site-wide configuration in the web server (probably) rather than being determined on an URL by URL basis. 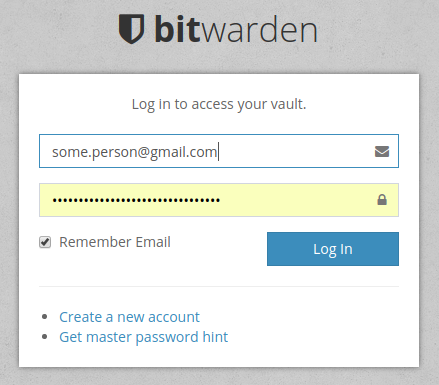 The actual client-side encryption library is loaded from vault.bitwarden.com, which is good. However, the (possibility of) inclusion of scripts from other sources negates any security benefits of doing so. The inclusion of Google analytics in a password manager is, in my opinion, inexcusable. It’s not required functionality for the application, so it shouldn’t be in there. It’s base64 again, and decodes into the same obscure binary string as the password when logging in. I have not spent time looking at how exactly the encoding / encryption is happening, so I cannot claim that this is actually secure. So keep that in mind. It does give credence to Bitwarden’s claims that all sensitive data is encrypted client-side before sending it to the server. I clicked on the “Data breach report” link on the left, and Bitwarden immediately sent my email address to https://haveibeenpwned.com. No confirmation, no nothing; it was disclosed to a third party immediately. 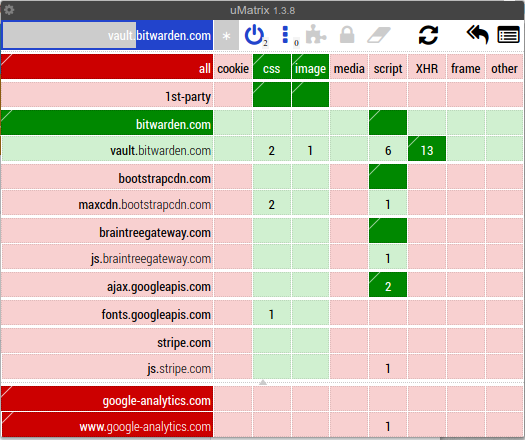 Well, actually, since I use uMatrix to firewall my browser, it wasn’t and I had to explicitly allow it to do so, but even most security nerds don’t use uMatrix. That’s not cool. Don’t disclose my info to third parties without my consent. One of, if not the, most important aspects is the developer mindset. That is, do they care about security and are they knowledgeable in the field? Bitwarden appears to know what they’re doing. They have a security policy and run a bug bounty program. Security incidents appear to be solved quickly. I’d like to see more documentation on how the encryption, transfer and storage of secrets works. Right now, there are some FAQ entries, but it’s all promisses that give me no insight into where and how the applied security might break down. So, is Bitwarden (Cloud) secure and should you use it? Unfortunately, I can’t give you any advice. It all depends on your requirements. All security is a tradeoff between usability, convenience and security. 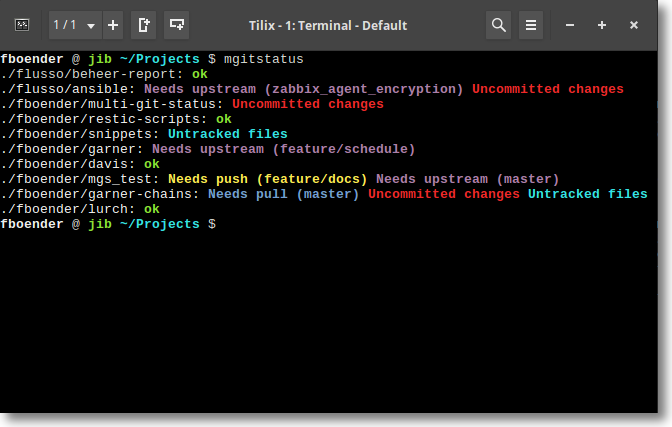 You can get multi-git-status from the Github page. I’ve been using the Restic backup tool with the SFTP backend for a while now, and so far it was great. Until I tried to prune some old backups. It takes two hours to prune 1 GiB of data from a 15 GiB backup. During that time, you cannot create new backups. It also consumes a huge amount of bandwidth when deleting old backups. I strongly suspect it downloads each blob from the remote storage backend, repacks it and then writes it back. I’ve seen people on the internet with a few hundred GiB worth of backups having to wait 7 days to delete their old backups. Since the repo is locked during that time, you cannot create new backups. This makes Restic completely unusable as far as I’m concerned. Which is a shame, because other than that, it’s an incredible tool. 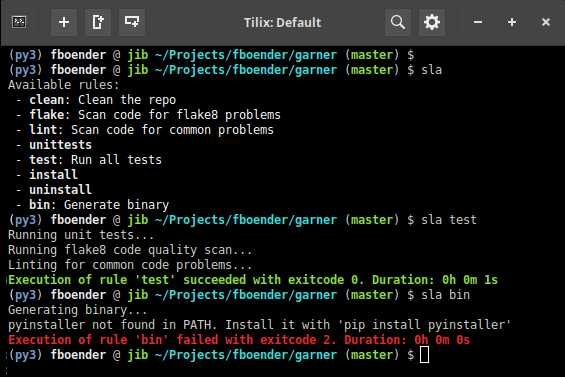 I cobbled together a unixy command / application launcher and auto-typer. I’ve dubbed it Lurch. Auto-type TOTP / rfc6238 / two-factor / Google Authenticator codes. Unixy and composable. Reads entries from stdin. As a generic (and very customizable) application launcher by parsing .desktop entries or whatever. Quickly cd to parts of your filesystem using auto-type. Open browser tabs and search via google or specific search engines. 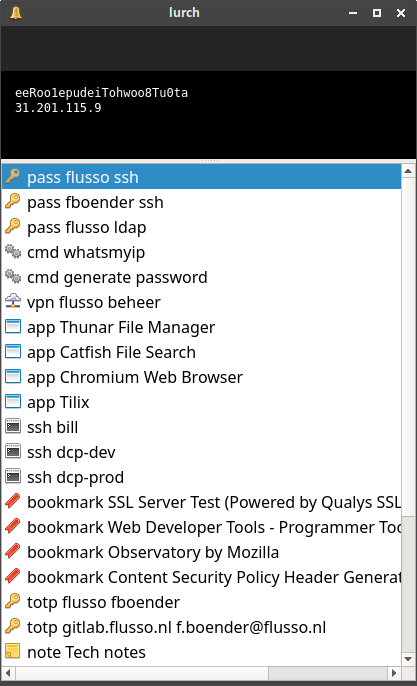 List all entries in your SSH configuration and quickly launch an ssh session to one of them. You’ll need a way to launch it when you press a keybinding. That’s usually the window manager’s job. For XFCE, you can add a keybinding under the Keyboard -> Application Shortcuts settings dialog. NO SUPPORT: There is absolutely ZERO support on this project. Due to time constraints, I don’t take bug or features reports and probably won’t accept your pull requests. You can get it from the Github page. I’ve added an “-e” argument to my multi-git-status project. It hides repositories that have no unpushed, untracked or uncommitted changes.